Mark Burchill announced that the Debunking (of President Doug) meeting will be held on from 5-7pm on Wednesday, June 29th at Wikiup Swim & Tennis Club, 500 Wikiup Drive in Santa Rosa. AND SO IT ENDS ………………………………. With the flag missing, we looked to the rainbow of flags below the podium and Carolyn Fassi led us in The Pledge. Bill Crowley read us some favorite Mark Twain quotes on politics and education. 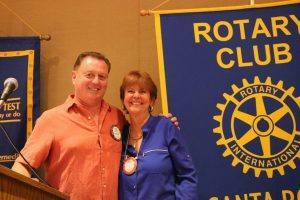 The only visitor today was Darcie Fellows, the president of Santa Rosa Rotary West. Cathy Vicini’s joke of the day was one that some people, regardless of age, can relate to! Ginny Cannon says that no one seems to be ailing. Nice to know our club members and their families are healthy. Robby Fouts said there was $108 in the raffle today. Vickie Hardcastle had the right number, but the wrong marble. Oh well! She has $10. 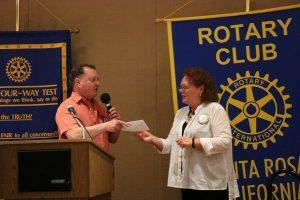 Debi Zaft had the drawing for the Rotary Magazine readership. Steve Olson had the most entries and he got the prize…..$100! Kathy Schwartz received her blue badge today! Yeah!!!!!!! President Doug introduced the head chef for the Flamingo and thanked him for his good food this year. 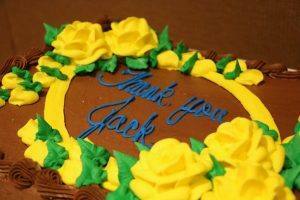 Then we all got a piece of cake to commemorate Jack Abercrombie’s 11 years as secretary. Yummy! Tim Fawcett and Tim Delaney read some more dictionary thank yous from the third graders at San Miguel Elementary School. The letters are so cute! Jack Abercrombie is retiring after 11 years as service as club secretary. Applications are available to apply for the job. It pays a small stipend on $900 a month. If you are interested, apply immediately. The committee to pick the new secretary will be meeting next week to make the selection. Don McMillan gave his last pep talk for the Giro Bello volunteers. Please note the job(s) you signed up for and be on time! 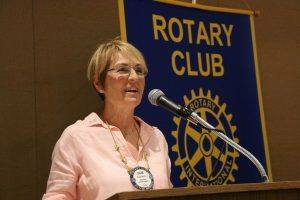 Mark Burchill announce the Rotary Means Business meeting on Thursday, June 23rd at Maureen Merrill’s office………..Mark also wanted to remind us all that next week’s meeting is at the Wikiup Swim and Tennis Club at 5:00. There will be no meeting at 12:30 that day, so don’t go the Flamingo! The meeting will cost $24.00 as usual. We will be grilling hamburgers and hot dogs. There will be beer and wine, but if you want anything special, bring it yourself. 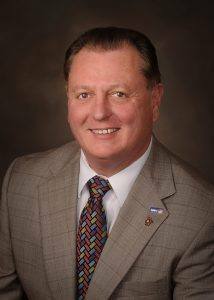 Matt Fannin will be leading the road marking committee on Friday from 9:30 to 1:00ish. They could use two more people. No Meeting on July 6th! Emily Harrington was pleased to announce that the Giro Bello had total sponsorship dollars of $36,045! Best yet! 50% of the club was a sponsor or brought in sponsors. She held a drawing with numerous prizes for those who got $500 or more in sponsorship money. Rich de Lambert alone got $2000 in sponsorships! The two big prizes went to Gary Swartz and Carmen Sinigiani. 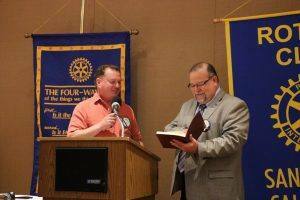 President Doug was going to name the Rotarian of the month, but that person was not at the meeting. 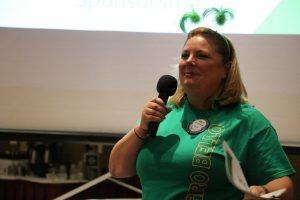 However, we do have a Rotarian of the year……drum roll please….Diane Moresi! Diane has done an outstanding job in all different capacities this year, but her taking on the New Gen Peace Program was the capper. 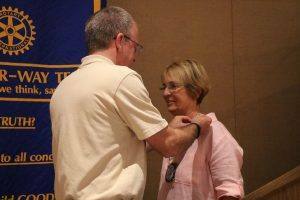 Matt Fannin, last year’s Rotarian of the year, gave her the pin. Diane will get free lunch for the next year. However, if she misses a meeting, she will have to pay the $10 fee! LOL! Let’s have fun! Yes we did! Jackie McMillan and her program committee did an outstanding job. Eradicate polio in Africa. Well, we did have help from our 1.2 million Rotarian friends! Growth. We closed the year with a net gain of 5 members. We stand at 115 members. Marketing and Public Relations. We have a budget and we are trying to use social media, our website and the internet more to get our message out. WCS Global Grant. We did it! We funded a micro loan in Columbia. Database upgrade. We are one of the few clubs getting our members to log into dacdb and getting our database up to date. They got the secretary a new computer. Steve Marburger and Richard Lazovick are our new tech gurus. Club project. We have been looking for a club legacy project for a number of years. President Doug brought us the New Gen Peace Program from the Brazil convention. The first year was quite a success. 26 kids took on the program and made it “Foster the Future.” It looks like it will be implemented around the world. District 5130 is making it a project for this next year. Let there be peace on earth and if it begins with Rotary, so be it! President Doug said the passing of our dear Nick Knickerbocker and Jack Abercrombie’s battle with pneumonia were hard on him. He thanked Debi Zaft for filling in for Jack as he recuperated, with a gift certificate for a massage and a bottle of Trecini wine. 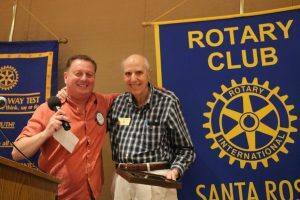 President Doug got Jack Abercrombie up to the podium and thanked him for 11 years of club service. Gave him a nice plaque too. 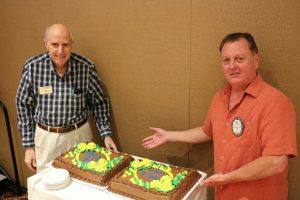 Thanks to Jack Geary and Dan Schell for doing the sergeant at arms work for each meeting. Lastly, President Doug got incoming president Jose Guillen to the podium to end the meeting. As Jose said, it will be about the “small things; fellowship and friendships” this next year…..but you just have to wait until July 13th to hear more about that! It is OK to come early to use the pool and tennis courts.